Yes, woken up by those annoying German buggers yet again! A relatively easy day, or so we are promised but still a healthy distance as even by road Ouarzazate is 150km away. The day started with a 57km road ride to reach the start CP, very boring and in the early morning quite chilly. Again I held off leaving the hotel until quite late to avoid having to sit around for an hour before my start. As a result I was last bike on the road and it was starting to feel a bit lonely out there! It was getting to the stage where I was starting to wonder if I was on the correct road, when I eventually passed another rider at the side of a road, he was fine having only stopped for a pee! I then passed a few of the Car amateur competitors who started about twenty minutes after us each day so I definitely knew I was heading the right way. I still got to the start with half an hour to spare and was relieved to find a large rock to park the bike against. After a brief wait I was waved forward a bit earlier than I was expecting and was soon underway. This stage was not timed being strictly liaison but we started as usual in groups of four at minute intervals, as we would on a special test. The first section was on a rocky piste that caused considerable dust, so despite my promise to myself to keep it steady, I wound it on a bit to get out in front of my group and get some clear air. This was OK until heading into some low hills the road book holder started flopping around. It appeared the zip tie holding it in place had given up the ghost again! I stopped where I could prop the bike against a rock wall and discovered one of the mounting bolts was loose too. So a quick tighten and a new zip tie and I was on my way. However I was now last bike on the road as everyone had passed me. As I pulled away I heard a strange siren like noise ahead, it turned out it was a siren when an ambulance appeared coming the other way on the narrow track! I had just about enough room to squeeze past. It would appear that our narrow little “off road” track was in fact a fairly major route leading to a number of villages. They must have had fun trying to pass the thirty or so riders in front of me! The fact we were on a fairly major route was confirmed shortly afterwards as I scrolled the road book on to find repeated speed limits and notes of prominent buildings. Sure enough I soon passed a clinic, a mosque, a school and what appeared to be one long strung out or possibly several adjoining villages. I passed another rider, who gave me the universal thumbs up “I’m OK signal” and I carried on out into wide open country, climbing higher into the hills, the track was very twisty with a few sharp bends that had the ability to catch you out. It followed a wide valley and eventually headed over a col that I remembered from day one. On the other side there was a section of tarmac about 400m long before returning to stony piste, why they chose to come all the way out there into the hills to lay that one section miles from anywhere, I have no idea? 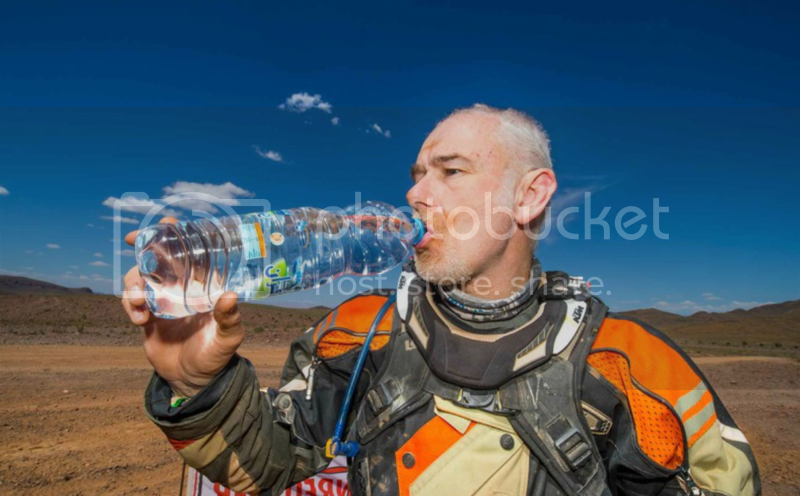 On the other side I started to catch up with several riders and we then turned hard right to head into another village, the road book said to turn left and enter a oued (river bed) but I couldn’t see the turning. The other riders carried on up the piste as it climbed out of the village but I wasn’t convinced and the trip meter was definitely past where I should have turned. So I stopped part way up the hill and looking back into the village, immediately saw one of the organiser’s trucks sitting in the dry river bed, it had been hidden behind a large earth mound. I turned round and made my way down, using the truck to park against. 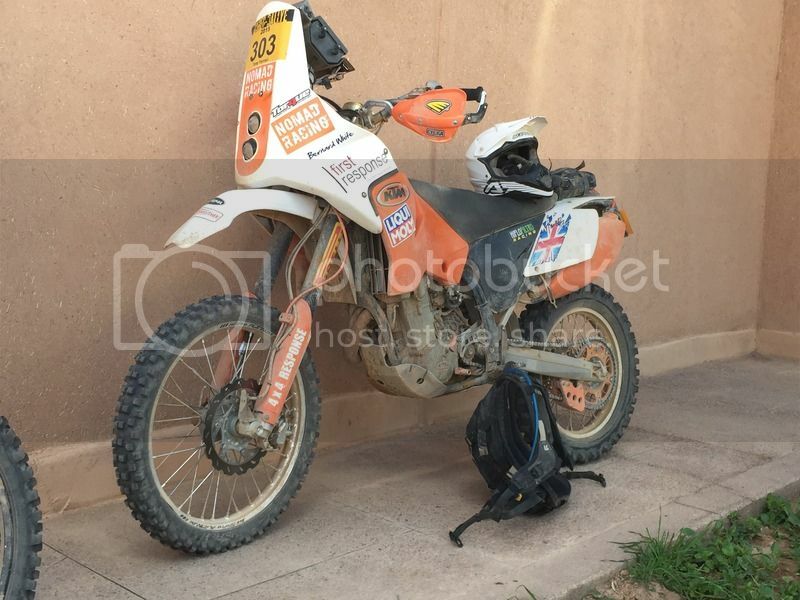 This was the stone filled oued I remembered struggling along on day one but this time only the Pro classes had to ride in it, we got to follow a smoother piste that ran alongside, constanly crossing and recrossing the oued. At one crossing I saw the flag of a Secret Check Point but as I stopped to turn, another British rider running back from the SCP shouted to carry on as it was only for the pro classes. 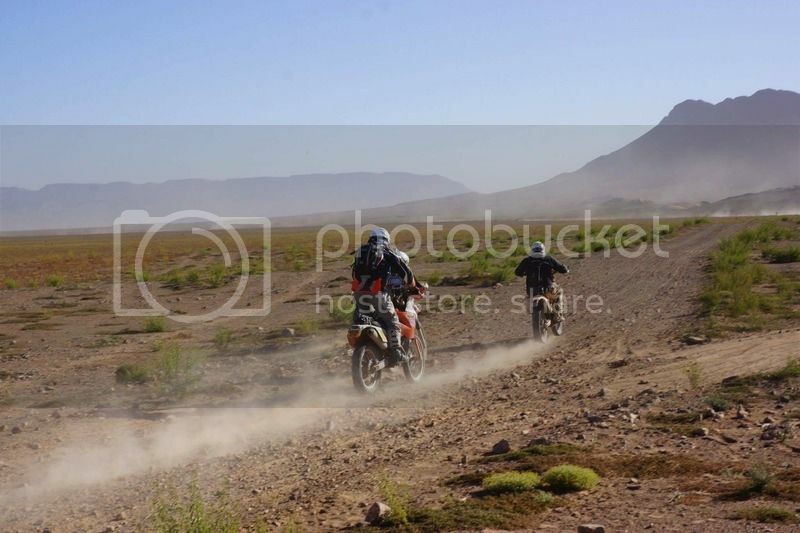 We eventually turned to ride along the oued but the gravel was less deep here with patches of standing water, so quite familiar terrain really (just the 30 degree heat that wasn’t)! A long winding piste led to another village then to a new straight road with piles of stone blocking the access, so you had to follow the old road that wound along, constantly crossing and re-crossing the new one. Except the two riders in front of me decided to ride over the stones and use the new road, so I followed suit, as did a few more riders behind me. This was easy going with just the two piles of stones to ride over each time the old road crossed, no handicap after the terrain we had been over in the last week. The road book must have been written with the new road in mind as the trip meter was spot on when we eventually reached the turn off to a visible CP off to our right. This was the start of the first special stage. After a short break, I got my time card signed and got on my way. This was a relatively short stage of about 35km so unlike most specials where I just rode at a steady pace, this one I rode more like a UK rally and upped the pace, I know this broke my "keep it steady rule" for the last day but I wasn't pushing hard, just enjoying the ride. The stage was all on stony trails that weaved across low hills and through valleys, great riding! At one point the road book instructed us to turn left off a main piste and then follow a smaller parallel track. However at this point another rider came flying past staying on the main track. The road book then took us back across the main track, looped us round and re-joined it further along. The other rider had just stayed on the track and ridden straight through. At first I thought he must have interpreted the road book and realised this was just a (slightly unnecessary) detour. Then as we climbed on the main track again, the other rider slowed right down and kept glancing to our left. Then it dawned on me what he was doing, glancing at the GPS I noted that we were a fair way to the right of the route (because it just draws straight lines between waypoints). The other rider had blasted straight through and was now getting confused because he wasn't following the road book at all but blindly following the GPS track! I would have thought after a week of racing he'd have worked it out by now. I just overtook him again and continued up the track, confident I was on the right route as we had a CAP heading that I was spot on and the description said something like "follow power line" sure enough there was a line of poles running right beside the track. Before the rally I was told that just by navigating well on the road book I could get a top ten finish as so many people just followed the GPS track and as a result missed Secret Check Points and incurred big time penalties. I hadn't believed this entirely but after that incident I was convinced. After all this was supposed to be a "navigation rally". It didn't seem long before I rolled into the CP to end the stage. There followed a short road ride into Agdz, the scene of our fuel stop on day one. The petrol stations were full of bikes but I decided I didn't need to refuel. Several Italians left one station as I approached and I tucked in behind them as we climbed into the Draa valley and over a spectacular pass, with stunning scenery. After several kilometres of fantastic bends, we pulled off the tarmac to a CP. 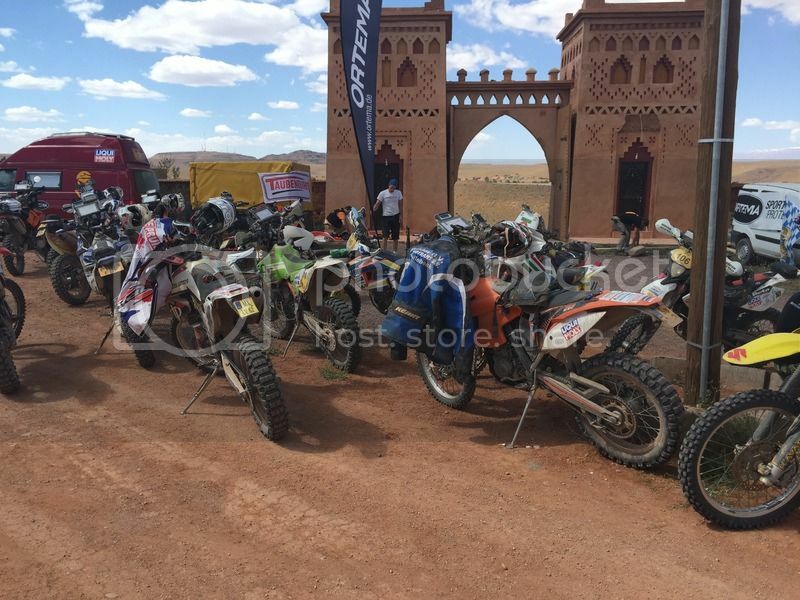 Here the pro classes started a second special stage but us in the amateur classes returned to the road. I was feeling a bit cheated as I was more than happy to do a bit more racing. A straightforward road ride took us to another CP just off the tarmac, this was the end of the special stage. As I listened to some of the Moto Pros described the horribly rocky track they had just raced over and how hard it had been I no longer felt cheated. From here it was a short distance on the road to a restaurant where we were all to re-group, competitors and service teams and were all treated to lunch by the organisers. Approaching the entrance that was manned by several Gendarmes, I swung smoothly onto the gravel driveway and the rear wheel just carried on round, unceremoniously dumping me on the gravel! The Gendarmes all ran over but we're not sure whether to be concerned or to laugh at my antics, however when they saw me laughing at my own stupidity, they all readily joined in. After picking the bike up, I rode up to the gate, checked in, met up with John, Radu, Elvis, Anny and Sophia, parked up the bike and sat down for lunch in a Bedouin style tent inside the restaurant's walled compound. After this much beer was dispensed and a podium ceremony was held for the winners in each class, with garlands presented, much champagne sprayed and all to a background of.... yes you've guessed it, our old friends Rammstein!!! 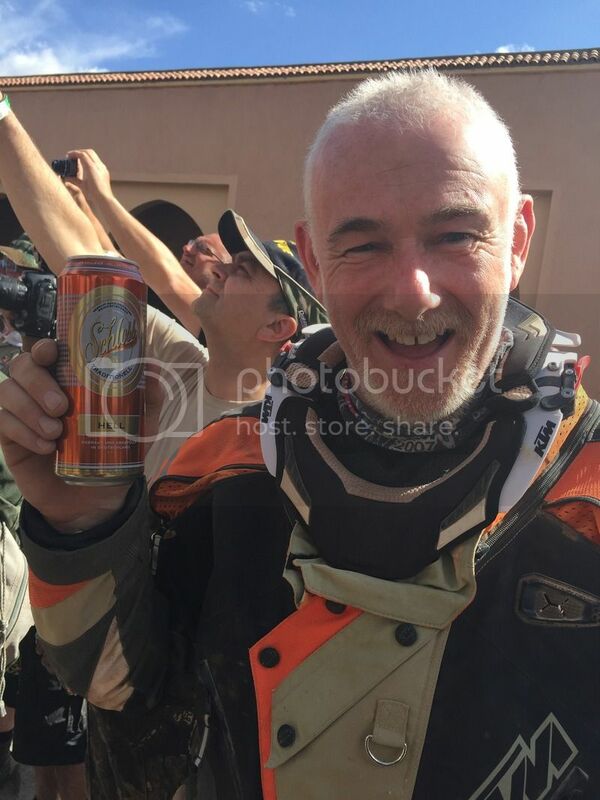 Yes we rode through Hell to get a can of Hell! Afterwards Radu's car and my bike were loaded onto the trailer, then I retreated back to the hotel room for a much needed shower and we got ready for the official awards ceremony. 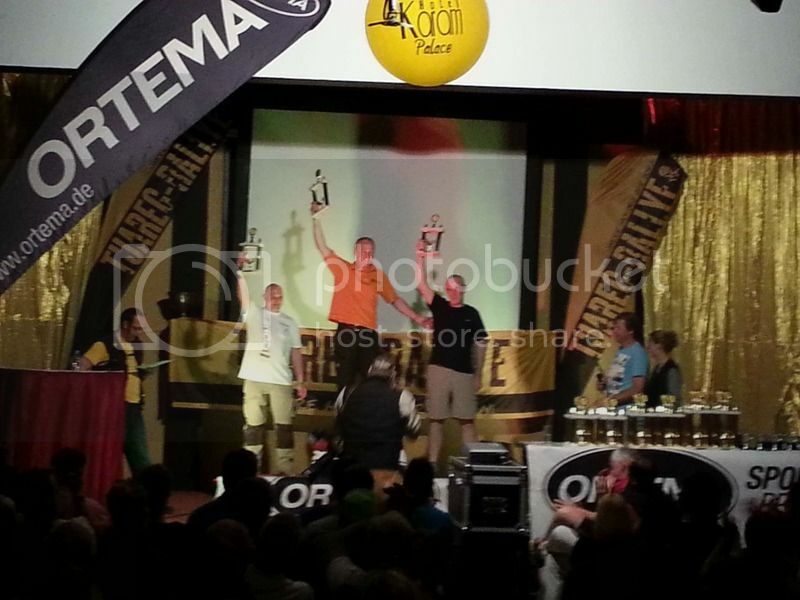 Here I was pleasantly surprised that not only had I held onto third place in the Moto Amateur over 50s but I was called up on stage and awarded with a trophy. Not bad considering my only ambition was to finish! Radu and Elvis had held on to second place in Car Open Series, so a great result all round for Team RCBS Rally Raid / Nomad Racing! After dinner and a couple of beers at the end of race party in the bar, I headed off to bed for a good sleep and for the first time in a week, a decent lie in.